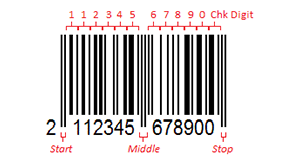 EAN code (also called EAN-13 and EAN-8) is the product labeling barcode used throughout Europe and much of the world. Originally called European Article Number, it is now referred to as International Article Number though its acronym has been retained. Like its predecessor, UPC, it is both a barcode symbology as well as a standardized numbering scheme for its use for countries assignments. 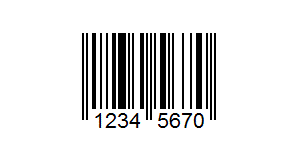 Unlike many other more general barcode symbologies (e.g., Code 39, Code 128, Code 25), its purpose built for a specific datum: a 12 digit product code (with EAN-8 representing 8 digit product codes). After the successful adoption and standardization of Universal Product Codes (UPC) in the early 1970’s US market, the 12 member countries of the European Community set out to adopt a barcode standard for retail operations as well. In 1976, the EAN symbology was adopted. It is a superset of UPC, using the same symbol characters, check digit algorithm, and general structure. A UPC number (which is 12 digits) can easily be converted to an EAN-13 by simply prepending a 0. The check digit will be unaffected and remain the same. The most significant enhancement was the addition of a country identifier, which UPC does not include, limiting its use to fewer markets. It is further characterized as continuous; that is, there is no inter-character space between adjacent characters. The space between characters is part of the data representation. Just like UPC, each data character is represented by a unique pattern of two bars and two spaces, with bars/spaces being one, two, three, or four modules wide; each data character is a total of seven modules wide. Again, just like UPC-A, EAN-13 uses a start pattern, stop pattern, a middle (guard) pattern, and a single check digit. It is worth noting that this symbology uses a parity scheme for its data characters. Depending on where a digit appears in the symbol, the pattern used to represent the digit will have either odd parity or even parity. Odd parity means that the total width (in modules) of the black bars used for the digit is odd, while even parity means the total width of the black bars is even. Hence, every digit (0-9) has two bar/space patterns: one with odd parity, the other with even parity. Unlike UPC-A though, which encodes the first 6 digits with odd parity and the other 6 digits with even parity, it uses a much more sophisticated scheme. To encode a 13-digit EAN, the number is broken into three groups of one, six, and six digits. The first digit is not actually represented with a data character; rather it is represented by the odd/even parity pattern of the characters used to represent the first group of 6 digits. The second group of 6 digits is always represented using even parity. 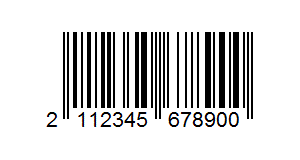 This allows an EAN-13 barcode to represent 13 digits in the same space as a UPC-A (12 digits). Further, when the first digit of the EAN-13 is 0 (meaning the EAN-13 contains a 12 digit UPC), the pattern used for the first 6 digits is all odd parity, resulting in the exact same symbol as UPC-A. By counting the module width of each of the first 6 data characters, we observe that the parity pattern in use is odd, odd, even, even, odd, even (OOEEOE), which is the pattern for the number 2 (the first digit of the EAN-13). The remaining 9 digits are typically divided into a manufacturer code and product code; the number of digits for each can vary by country code. This division and the assignment of manufacturer codes is done within each country by the country’s GS1 member organization. EAN-8 is similar to UPC-E in that it is intended primarily for small package labeling where a full EAN-13 may not fit. Unlike UPC-E though, EAN-8 codes are not a compressed form of EAN-13. 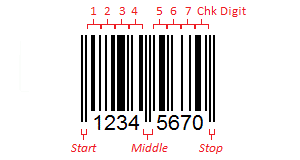 All 8 digits of the EAN-8 number are encoded in the barcode symbol (whereas UPC-E uses parity to represent two data digits). An EAN-8 number consists of either a 2 or 3 digit county code, followed by a 5 or 4 digit product code (plus a check digit as the 8th digit). EAN-8 codes are assigned to specific products directly by the numbering authority (GS1). Music – a newer standard, the International Standard Music Number (ISMN), is an EAN-13 with the country code 979 used to identify notated music publications. How do we help developers using EAN? The Cognex Mobile Barcode Scanner SDK supports EAN detection, enabling developers to gather relevant workflow and application data. You can download the SDK for free by registering on the Cognex Mobile Barcode Developer Network. In addition, the Barcode Scanner SDK supports a broad range of symbologies to meet your growing development needs. Packaged with the consumer product barcodes of UPC, GS1 Databar, PDF417, and QR Code, the SDK Consumer Developer License (CDL) lets you deliver a powerful retail experience quickly and easily.